This is one of the greatest of all French dishes, traditionally made with a mixture of small Mediterranean rockfish that the Marseilles fishermen find in the bottom of their nets. Here I have used larger fish but you can make this recipe with good results using almost any firm-fleshed fish. In a large saucepan, sweat all the vegetables (except the potatoes), herbs and spices in the olive oil for 5 minutes. Add the wine and reduce by half. Layer the potatoes on top of the vegetables and scatter the fish on top. Add enough water to just cover and bring to the boil for 2 minutes. Skim. Cook just under simmering point for 30 minutes or until the potatoes are tender. 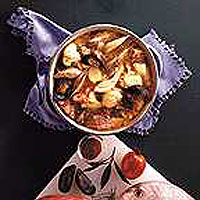 Add the mussels, raise the heat a little and cook for 4 minutes or until they are open. Discard any unopened shells. Place the cooking pot on the table for everyone to help themselves. Accompany with some aïoli mixed with a little chilli, and croutons made from French bread brushed with olive oil and garlic and crisped in the oven.